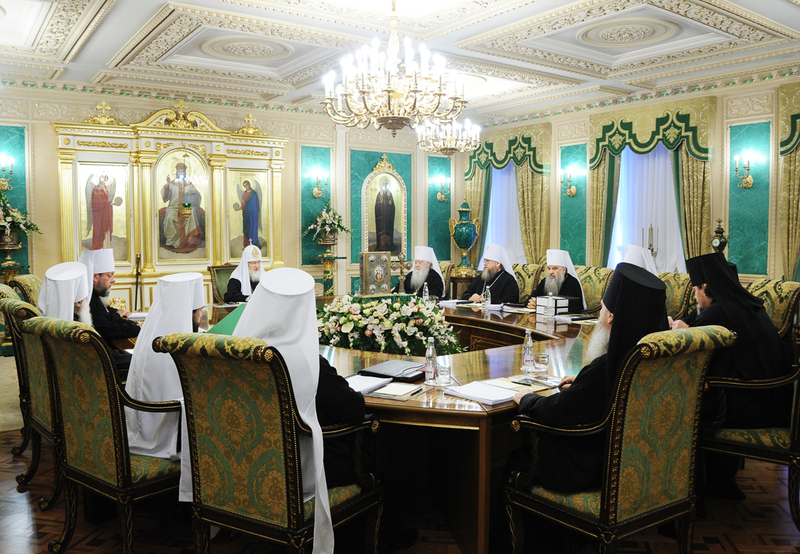 On 2 October 2013, the Holy Synod of the Russian Orthodox Church met for a regular session at the Synodal Hall of the official Patriarchal and Synodal residence in the St Daniel Monastery, Moscow. Summoned for the winter session (September-February) are Metropolitan Sergy of Ternopil and Kremenets, Metropolitan Kirill of Stavropol and Nevinnomyssk, Archbishop Konstantin of Kurgan and Shadrinsk, Archbishop Iosif of Birobidzhan and Kuldur, and Bishop Nestor of Korsun. “Today we are to summarize the celebrations which took place in the territory of historical Rus’ on the occasion of the 1025th anniversary of the Baptism of Russia and have become a very significant spiritual and cultural event. Then, I would like to share with you my thoughts concerning my visit to Moldova on the occasion of the bicentenary of the Diocese of Chisinau and Khotyn, now the Orthodox Church of Moldova. After that, I will make a brief report on my visits to other dioceses of the Russian Orthodox Church. “This is, probably, the major item on our agenda: today we should complete a corpus of documents which will lay the foundation for training the Russian Orthodox Church’s specialists in various fields. You know that we have commenced this work and a number of documents have been adopted. Today we will discuss a final document which will enable dioceses and metropolias to start a large-scale training of specialists in the fields of catechization and mission, as well as specialists working with youth, and social workers. “It is highly important that those who are involved – and their number is increasing and during my visits to dioceses I can see how actively this aspect of our church life is developing – should have a good theological education as those who will be responsible for this aspect of the life of parishes, dioceses and deaneries… Today we will have to launch this important work. “As you know, we have re-organized the Patriarchal Commission for the Protection of Family, Maternity and Childhood, and today we should think over the Statute of this Commission.